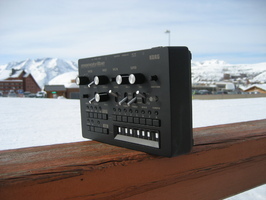 The Monotribe is a small drum machine that includes four different instrumental parts (one mono synth and three drum sounds) and a 16-step sequencer. Battery operation and the small integrated speaker ensure autonomy. That's why I didn't hesitate to take it with me to the mountains in spite of the very low temperatures. By the way, the announced battery life is 14 hours — enough to compete with Paulo the whole week. As for design, the Monotribe is a small black box (8.2" x 5.7" x 2.8") made out of plastic and weights 1.6 lbs (without batteries). The product seems to be sturdy and well manufactured. The front panel provides quite a lot of action: five rotary controls, six slim trim pots, six three-way selectors, 17 push buttons, 15 LEDs, and a ribbon/keyboard controller. On the rear panel are all connections, which aren't many! Besides the on/off switch and the power in for external 9V DC power supply (ref. KA-350, unfortunately not supplied! ), you get only four minijacks and one 1/4" jack: step sync input (impulse-type sync with adjustable polarity, for example the rim shot of a drum machine), sync out (delivers +/- 5V during 15ms for every step), phones out, audio in, and mono audio out (1/4" jack). No CV/Gate or MIDI connections! This means you can program and sync the Monotribe but you can't control it remotely... at least in the original version since some DIY fans have managed to create upgrade kits. 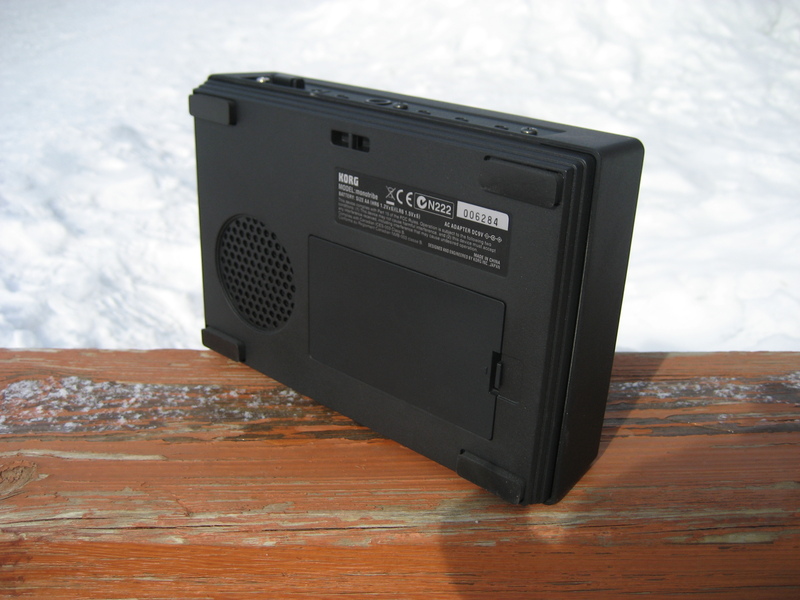 The bottom side gives you access to the integrated speaker and the battery compartment for six standard AA batteries (this time, Korg does provide the batteries). At first, the use may seem extremely easy because you'll understand right away the function of every control element. But only at first because a recent update (OS 2.0) makes things a bit more complicated. An update, but how is that possible? The unit has no MIDI support... It is possible in the old-fashion style of sending an audio file via the sync input! Since our Monotribe still had OS 1.0, we updated it right away to 2.0 and we didn't have a single problem. Actually, the product is sold with a small minijack cable required for updates: I connected the headphones output of my notebook to the sync input of the Monotribe. I then started playing back the WAV audio file previously downloaded from Korg's website and had the possibility to monitor the process thanks to the control panel LEDs. Everything was over in a few minutes. In the present review we will describe the features regardless of whether they are available or not in the previous OS version. By the way, notice that most new features are accessible via button combinations, which makes things definitely not easier specially considering that these features are not written on the unit itself. All direct controls are logically placed on the front panel: the upper half is dedicated to the analog synth, while the lower part is divided in two. 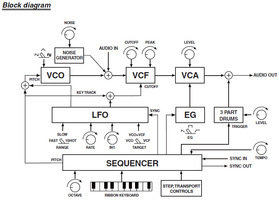 On the left side you have the transport controls and the part section; on the right side you have the step sequencer and the ribbon keyboard. 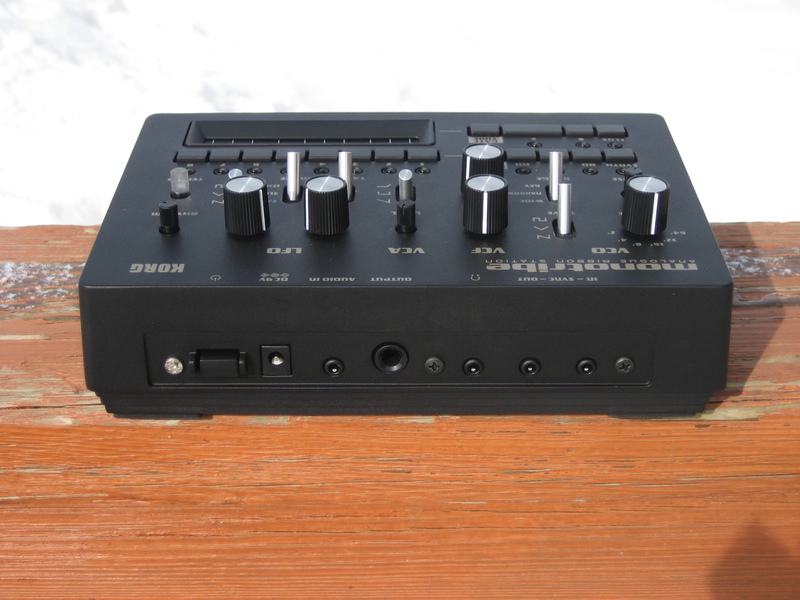 Everything seems to be done with comfort for live applications in mind and to offer much more versatility than the Monotron. 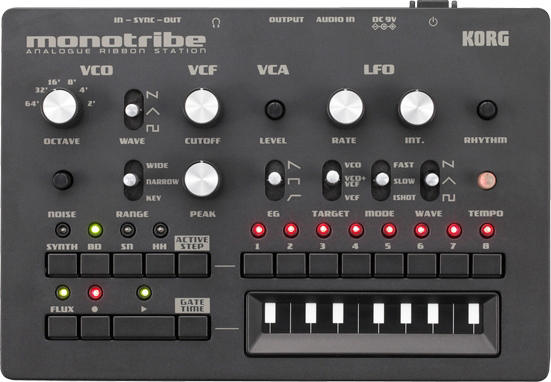 To play the Monotribe start the rhythm, add drums using the part buttons, play/mute/enable/disable the steps, and trigger notes using the ribbon keyboard. 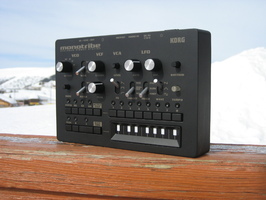 The latter has three different operation modes: extended mode (six times the range of the mini-keyboard), restricted (only the range of the mini-keybaord) or chromatic (in half-tone steps). You can add or suppress instruments in real time for each of the 16 steps (a button combination gives you eight additional steps) and the four parts. 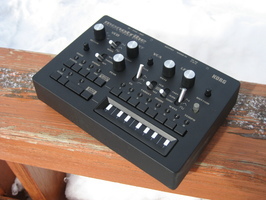 With the mono synth, you can adjust direct-access parameters in real time using the controls. It couldn't be easier. The sequencer of the Monotribe offers 16 steps for each of the four different parts. Each step can be played and muted in real time, both in playback and programming modes. The LEDs allow the user to see and monitor played/muted steps. The tempo range is variable depending on the setting in global mode: narrow (60-180 BPM) or wide (10-600 BPM for special effects). The transparent trimmer dedicated to tempo is equipped with a nice flashing diode that follows the rhythm. 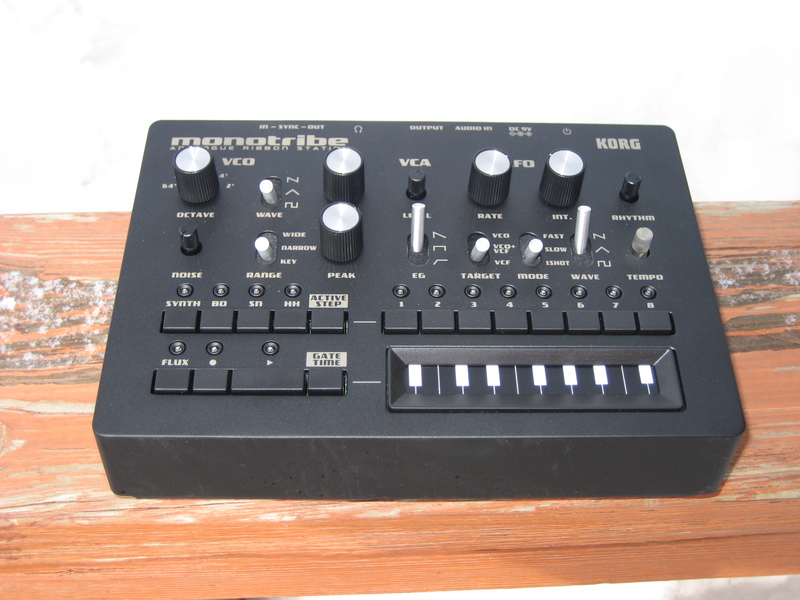 In the synth section, you can trigger notes in step-by-step or continuous ("flux") mode using the ribbon keyboard with three different sensitivity levels. Press [Active Step] and the ribbon at the same time to generate level changes in real time. The latter are stored as soon as you switch to rec mode. Hold [Gate Time] to change and program the gate time in real time. With drum parts, doing this creates automatic drum rolls whose speed is controlled by the ribbon. At this point I have to be very clear: precise note triggering is not easy with the ribbon, or at least it requires good skills. And in "flux" mode, it's even harder! [Active Step] allows you to enable/disable a step for each of the four parts independently. In this case, a disabled step is ignored instead of being silent like it would when muted. As a consequence, the loop can have a different number of steps for each part, which gives you the possibility to create complex rhythmic patterns to give more life to the machine. 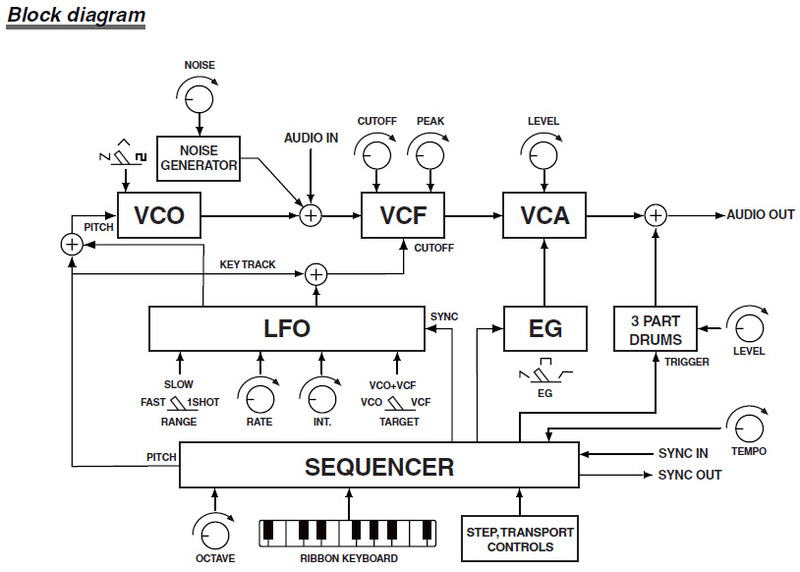 You can reset the sequence for the synth or drum parts. The memory includes only three sequences: the active sequence (stored in the RAM), the stored sequence, and the demo sequence, which is far from being enough. We would like to have at least eight different sequences, all the more considering that it is not possible to save to an external device... This instrument is definitely conceived to create rhythms live! If you want to use several Monotribes, you can daisy chain them in order to use the sequences of both units connecting all sync ins/outs in a loop. In the end, this small box can serve more purposes other that annoying Paulo when he's sitting next to the fire. This mobile solution is made for people who prefer intuitive and spontaneous creativity rather than complex menus and multiple memories. It's a pity that the hidden features accessible via button combinations are not printed on the device. The ribbon keyboard is really hard to use to use if you are looking for precise triggering. 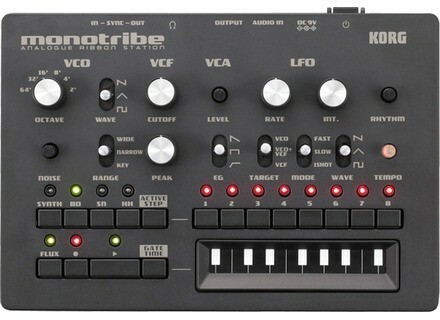 With the Monotribe, Korg reinforces the idea that live electro musicians can be unexperienced keyboard players or programmers. 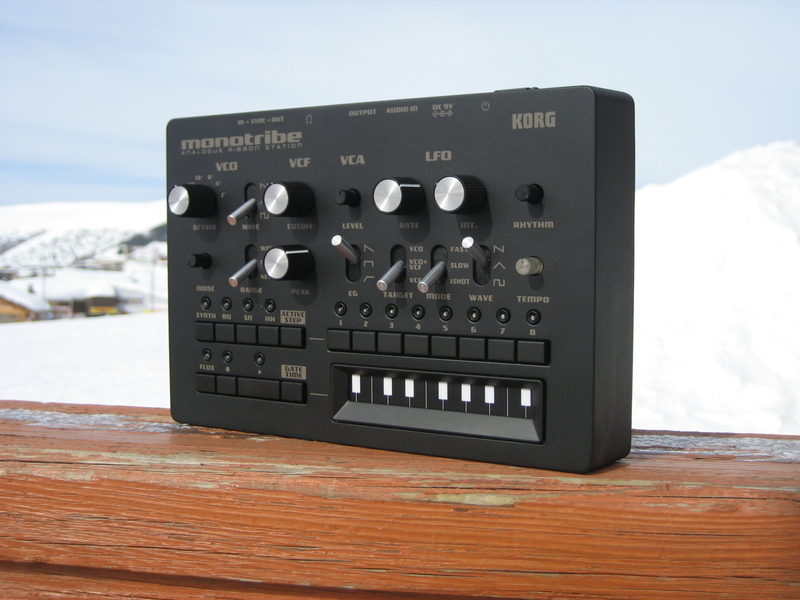 If you want to trigger real analog, MS-20-like loops in real time without spending a fortune or learning by heart the product manual, the Monotribe is probably your instrument of choice.